Tips on 3-marking the Leo? Starting to 3-mark tanks is what really started me to improve as a player and nowadays its the only thing that motivates me to play. I wish you the best of luck in your future markings! Once you get hooked you are hooked for good! True that. Once the MM changes come in, I'll try to take on the Defender, IS-3A, KV-5, T34, Lowe, M4A1 Rev., and all the other Tier 8 tanks I have. I started to do bad tanks such as the Leo because I thought it would be easier... well, I was wrong, but now that I've got 2 on the Leo, I must get the 3rd one! 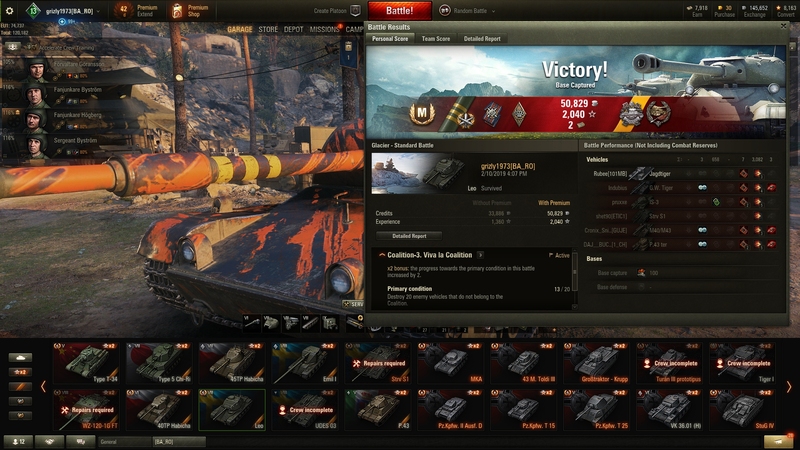 After this, I'll go for the Emils, the Kranvagn, and then back to the Tier V Strv m/42. I've already marked the Strv 74 and I'd love to 3-mark the entire branch. What a dream! Oddly enough. It's one of my top fav 5 tanks in the game. It's flexibility just suits my style more vs say the Comet. Edited by SuNo_TeSLa, 08 February 2019 - 06:09 PM. Carry a lot of APCR. Try to get spotting damage if there is an opportunity, don't act like a light because it's not. Try to stay in the battle for as long as you can ==> don't take unnecessary damage. Make the most out of defeats to hold the mark percentage. On the opposite, be aggressive if you've a good team. If you can spare the credits, use food for the last 4-5% but be aware that it burn a lot. For equipment i use rammer, vents and optics.and good luck with the maps! Am on the same page as you man, just 2 marked it but I like it (with the 75 mm gun). Am pretty excited for the new upcoming t8 swed med. 1. Always stay alive untill last second of battle to maximize damage. 2. Dont really care about your team winning, its the same for you win or lose if u have farmed plenty of damage. 3. Have 90% of your loadout with gold ammo. 4. Spotting damage is as much important as normal damage, so you must not red-line-snipe (binos is a nice touch, I have optics loaded instead). Edit: My friend Kuzkina , great minds meet. Try do as much dmg and assist, try to survive as long as possible, relocate when spotted. When it comes to gun. It's down to style. I ran 100% 10cm gun on mine when I did it as it fits my style more. If not I did feel like was playing a Comet with a bad turret as I had to stay exposed more to get the same damage. I played it like a hybrid in a +2 game, and a bully in a +1 and top tiers. As it can sneak around and farm assist on most passive spot locations as well as most lights early on vs tier 9. You need to farm assist and damage as much as you can. And tracks shots when you farm damage. Always go for track first if you know others will hit it. It's free assist on the way. As top tier or in +1 I used the alpha on the 10cm. Constantly moving around. Peek over a ridgeline, flank fire, and harras, use the speed to relocate and do it again once the guns turn around towards me. Or I follow the med pack and bully with them. And when it was a loss. I did fall back and used the alpha, or stayed up front and spotted for my TD campers etc. What ever gains you more. My 3 MOE game was on the last variant of Fisherman's Bay, as that's a great hybrid map for it. I stayed along the middle and spotted HT's and their middle meds. Then moved to the one lane and spotted and flank fired the middle from there. Got almost 4.5K combined. I switched between the guns a lot but the last 10-15 games before the mark was done with the big gun. I think its easier with the big gun as I found it hard to do damage with the pew pew gun. Personally I hated the Leo. 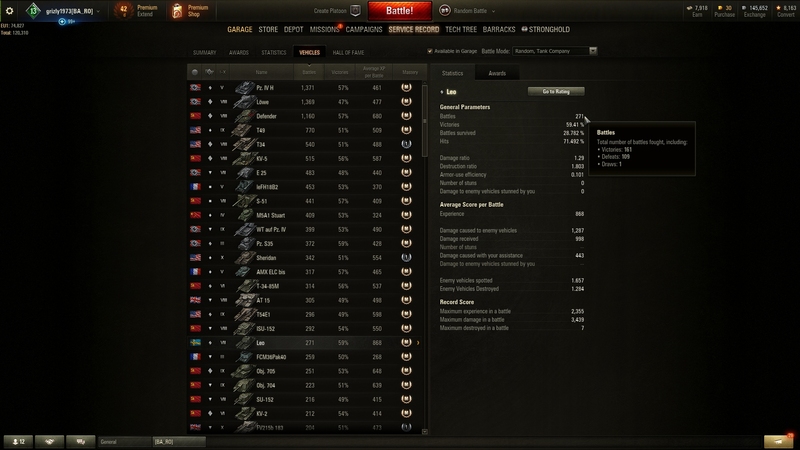 I think its one of the worst tier 7 MTs in the game. At least the big gun gives you a little bit of fear factor but its slow, huge, no armor...only advice I can give is have patience and conserve the HP for the late game as its the only "armor" you will have. Max out VR and try to farm as much assist as possible. I liked Leo a lot. It's not very good, but 300 alpha on decently mobile/stealthy platform works for me. I suggest dropping binos for optics. Thank you everyone for the advice given! I'm (very) happy to announce that I've finally managed to get the darn 3rd MoE, after 271 battles! The final game was awesome, even with the worst possible MM and map. I'd like you to tell me if I'm below average with the tank, keeping in mind that I wanted to 3-mark it since the 1st battle played in it. (I think I'm kinda bad and it took me too long). Good job marking the leo no matter how long it took. Your DPG is good and with practice you'll get marks faster. grats on the three marks! I currently have the tank itself, but I'm not sure if I want to keep it to wait for the eventual sweedish med line, or sell it to continue the Heavy tank line. No below average player (or average for that matter) would be able to 3-mark a tier 7 MT. Good job man and congrats! Big gun definitely, so much easier to rack up damage and the HE potential against lights and paper TDs is much greater. Use Coated optics and Food instead of Binos to get better spotting and to improve gun handling. With the speed use it as a light when bottom tier, medium distance trader/support tank when you get better MM. Ran it with equal share AP/APCR/HE. A lot of people hate this tank but it’s one of my favourites. The speed in combination with 300 alfa at tier7 makes it versatile and a tank that can hurt more than expected. Gun depression also helps not getting shot.